THE playwright Dennis Potter yesterday likened the heads of the BBC to a "pair of croak-voiced Daleks" who had led the organisation into a near-fatal crisis. His attack on John Birt, the director-general, and Marina. duke Hussey, the chairman, came in his keynote address at the Edinburgh International Television Festival. on British Rail or British Coal". The director-general was not in Edinburgh to hear the attack, but Will Wyatt, managing director of BBC Network TV, said after the lecture: "Radical reform was our only option. I make no apology for seeking a BBC that is well-run. The beneficiaries are the programmes — and the public. Pennies don't rain down from heaven in broadcasting: without savings there can be no new developments. This can be painful." He added: "The BBC must seize the opportunity to shape its own destiny or our enemies will try to do it for us. Fragmentation is a sure way to weaken the BBC and its programmes." Mr Potter. whose television series include The Singing Detective and Lipstick on your Collar. described the BBC governors as "ageing, unrepresentative and demonstrably ineffective." He told an audience of 500 television executives and programme-makers that "palpable ambivalence and doubt where you pretend to be the commercial business that you cannot be, has led to the present, near-fatal crisis where it seems to be thought that the wounds, often self-inflicted, can only be staunched by shuffling about word-processed words about a new management culture." Politicians believed that cost accountants were the most suitable adjudicators of what could be seen on our screens, he said. "The old Titan should spawn smaller and more nimble offspring if its controllers cannot be removed." Radio and television could be separated and BBC 2 could become a separate public service broadcaster. He said Channel 4, if it continued "to evolve out of its original, ever-precious remit", could become a passably good model for the kind of television he sought. Its chief executive, Michael Grade, was becoming by default the new director-general. Mr Potter renewed his attack on Rupert Murdoch, calling for a "simple act of public hygiene", which would restrict cross-media ownership and prohibit newspapers from owning television stations. He described the new London weekday ITV company. Carlton, as a "predictable disappointment". Mr Grade, who used last year's lecture to denounce the "pseudo-Leninists" running the BBC, said yesterday on Radio 4's Today, that senior management were "as out of touch with staff as ever they were". Mr Burt will today face a question and answer session and tomorrow his deputy, Bob Phillis, will oppose a motion that the BBC is in danger of destroying itself from within. APA 6th ed. : Culf, Andrew (1993-08-28). Potter hits at BBC 'Daleks'. The Guardian p. 1. MLA 7th ed. : Culf, Andrew. 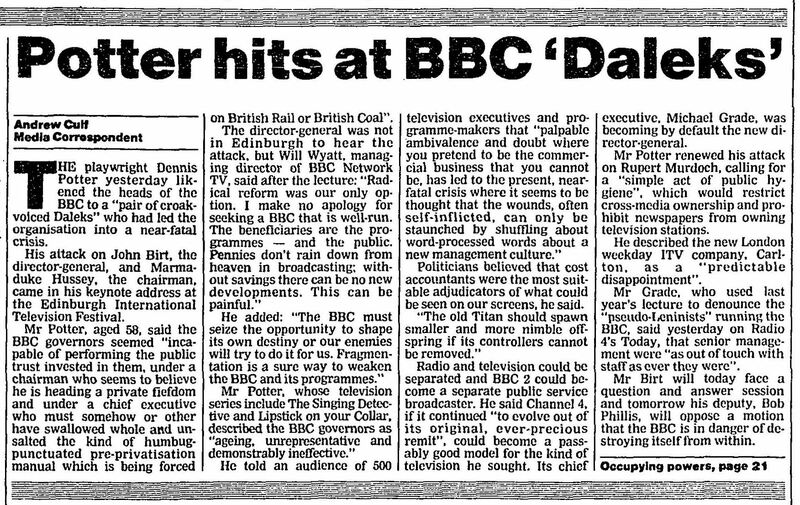 "Potter hits at BBC 'Daleks'." The Guardian [add city] 1993-08-28, 1. Print. Turabian: Culf, Andrew. "Potter hits at BBC 'Daleks'." The Guardian, 1993-08-28, section, 1 edition. This page was last modified on 19 May 2015, at 22:35.